Hey! I have a great idea. Why not start a holiday tradition of delivering these delicious cinnamon rolls to your friends and cohorts? Growing up, my mom always made them for her good friends at Christmastime, and you could literally hear the primal groans of pure joy rising from the rooftops of our town. I’ve carried on the tradition through the years and have won friends and influenced people just by delivering these rolls. They really are that good. ***This is the original Cinnamon Roll recipe! All other sweet roll recipe variations that I do come from this. Let’s start by making the dough. Mix 1 quart of whole milk, 1 cup of vegetable oil, and 1 cup of sugar in a pan. "Scald" the mixture (heat until just before the boiling point.) Turn off heat and leave to cool 45 minutes to 1 hour. Go fold laundry or sculpt or play Twister with your mailman or something. When the mixture is lukewarm to warm, but NOT hot, sprinkle in 2 packages Active Dry Yeast. Let this sit for a minute so the yeast gets all warm and moist and happy. Then add 8 cups of all-purpose flour. Stir mixture together. Cover and let sit for at least an hour. Go throw away the rest of your wrapping paper or build a Lego Rottweiler or do Yoga or watch Home Shopping Network and order a frozen pizza oven for your countertop or some cellulite cream. After an hour, the dough will look like this. And 1 "scant" (less than a full) teaspoon baking soda and 1 heaping tablespoon of salt. Stir mixture together. At this point, you could cover the dough and put it in the fridge until you need it—overnight or even a day or two, if necessary. Just keep your eye on it and if it starts to splurge out of the pan, just punch it down. Or, of course, you can just go ahead and make the rolls. Sprinkle surface generously with flour. Take half the dough and form a rough rectangle. Then roll the dough thin, maintaining a general rectangular shape. Rectangle should increase in both width and length as you roll it out. Here’s my beautiful, weird, lovely, delightful friend, Hyacinth. She came over to make cinnamon rolls with me. Ain’t she purty? Now drizzle 1 1/2 to 2 cups melted butter over the dough. Don’t be shy; lay it on thick, baby. You know you want it. Oh, by the way? This is not non-caloric. In case anyone asks. …followed by a generous sprinkling of cinnamon. Now, starting at the opposite end, begin rolling the dough in a neat line toward you. Keep the roll relatively tight as you go. Some of the butter/sugar/cinnamon mixture may ooze out toward the end, but that’s no big deal. Next, pinch the seam to the roll to seal it.Doesn’t Hyacinth have lovely hands? Spread 1 tablespoon of melted butter in seven round, foil cake or pie pans. Then begin cutting rolls approximately 3/4 to 1 inch thick and laying them in the buttered pans. Repeat this process with the other half of the dough. This recipe makes approximately seven pans of rolls. Let the rolls sit for 20 to 30 minutes to rise, then bake at 400 degrees until light golden brown, about 15 to 18 minutes. While the rolls are in the oven, make the deliciously sinful maple frosting. To a mixing bowl, add 1 bag of powdered sugar. …and 1/4 cup of brewed coffee. Also add 1/8 teaspoon (a generous pinch) salt. Then have a big, strong, virile man stir it up for you. I chose Marlboro Man. The mixture should be thick but pourable. Taste and adjust as needed. 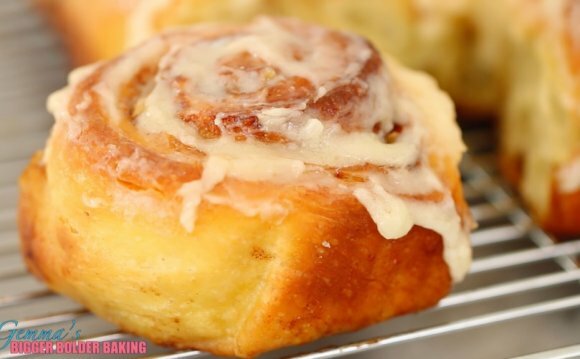 Generously drizzle frosting over warm rolls after you pull them out of the oven. And take a walk on the wild side. Don’t be afraid to drown them puppies. Be sure to get frosting around the perimeter of the pan, too, so the icing will coat the outside of the rolls. These are not non-caloric. Did I mention that? The frosting will settle in and become one with the cinnamon rolls. And you’ll be another step closer to being the most popular person in town…or the jiggliest, depending on whether you choose to deliver the rolls to friends or lock yourself in your pantry and eat them all by yourself.